Featured here is a rare c. 1750 map of Cape Town, South Africa, by the French cartographer Jacques-Nicholas Bellin. 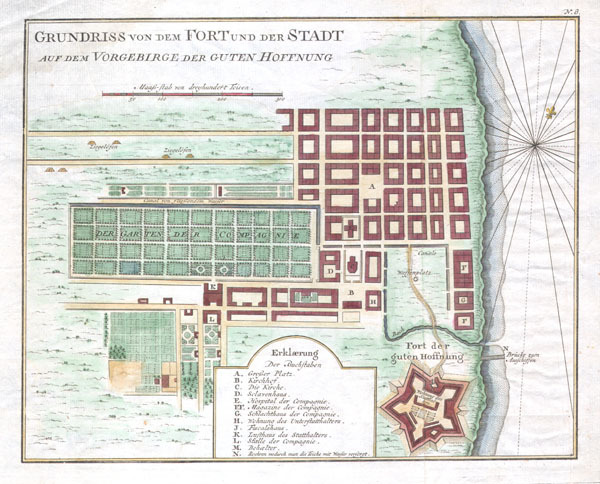 Map depicts the city and for of Cape Town in considerable detail with particular emphasis on the identifications of individual buildings and gardens. Text is printed in German and French. Very good condition. Minor watermark in the upper left margin. Else clean. Contemporary hand color. Original platemark visible. Wide clean margins. Blank on verso.